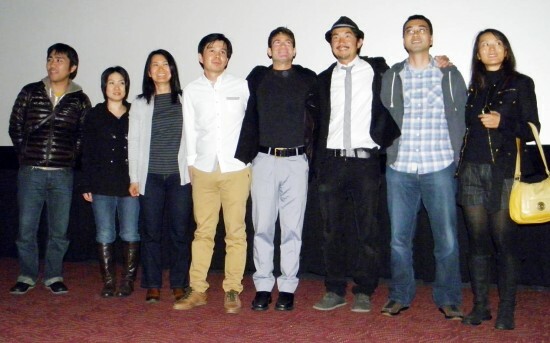 Benefit screenings of the documentary “Pray for Japan” were held March 14 at AMC theaters across the country, including multiplexes in Torrance, Orange and San Diego. Stu Levy’s feature-length film, which focuses on survivors of the March 11, 2011 tsunami in northeastern Japan, was seen from Maui to Washington, D.C. as well as Canada and the U.K. Proceeds are going to nonprofit organizations doing relief work. The film is playing until March 29 at the AMC Burbank Town Center 8, 201 E. Magnolia Blvd., Burbank, (818) 563-4901, www.amctheatres.com/Burbank8/. Those who attended the sold-out screening at the AMC Del Amo 16 had the opportunity to hear from the director. Levy, founder of the media company Tokyopop, is credited with helping to introduce manga to the English-speaking world and is familiar with Japanese language and culture as well as movie production. He went to the Tohoku area just days after the disaster and put the documentary together with an all-volunteer crew. He met Manabu Endo, a volunteer leader who appears in the film with his pet rabbit, Cocoa-chan, who was used as a therapy animal for the survivors. “He was the guy that said, ‘Will you make a documentary?’ … He’s an Ishinomaki guy and a real nice guy. When I started to actually film it, I didn’t know where to start, so I started with him,” Levy said. Levy recalled alternating between being a volunteer and a filmmaker. “The people in front of you … they haven’t eaten for a while and they’re in these shelters … You give them their first hot meal, and when you do that and they say ‘thank you’ … it just makes you feel like ‘Wow, this is what’s life’s all about’ … fulfillment inside your heart. Floating lanterns honor the memory of the tsunami victims in a scene from "Pray for Japan." The interviewees included Junichi Sato, principal of Ogatsu Middle School, who has been working to rebuild the school and bring the students and teachers back together, and Yoshiaki Shoji, an Ishinomaki city councilman who took charge of a shelter at an elementary school. Volunteers, including some from other countries, were also interviewed. The director visited Ishinomaki the week before the screening, for the first time in about six months. “The debris is gone, so from a visual point of view you go down the streets, a lot of stores are open, and that’s incredible,” he said. “But when you start to dig deep, you see there’s a lot of leftover damage. 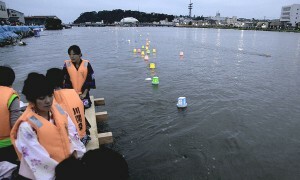 In the film, 18-year-old Kento Itoh, a high school student who lost his grandparents, mother and baby brother, considers ending his own life, but the discovery of a koinobori (carp banner) in the debris inspires him to honor his 5-year-old brother and other lost loved ones in a koinobori ceremony with taiko drumming. Kento was involved in another koinobori project marking the one-year anniversary of the tsunami, Levy said, but keeping him motivated is an ongoing challenge. Since there is no distribution company involved, the film is going international on a grassroots basis. Levy said he had heard from groups in Singapore and Germany that were interested, and he was scheduled to go to a screening in Hong Kong. “The traditional route of distribution doesn’t work, so coming up with a different route is really key, getting it to people who want to see it,” he said. In addition, there is a hosted screening program that will allow the film to be shown at schools, churches, community centers and other venues. For more information, visit www.prayforjapan-film.org.